From the California hills to the coast of Maine, Lupine is one of America's largest and most famous flower groups, both in the wild and in gardens. Each spring all over the US, gardeners fall in love all over again with the candy cane colors of one of the most popular garden perennials of them all - the lupines, and they plant them by the millions. 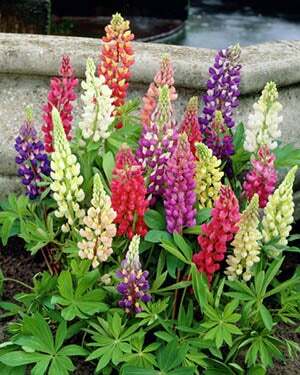 Lupine plants are famous for loving sandy soil. (This is why they often grow near beaches and in other other places with light, "loose" soils.) It's because they form long tap roots, and have to drive that root down deep into the soil. 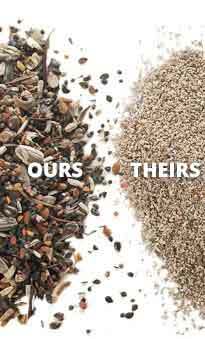 They can succeed on heavier soils, even clay, but the growth will be slower. Arroyo Lupine is an annual that creates sheets of blue along with the gold of California Poppies all long the Pacific Coast. "Arroyo" means "canyon" in Spanish, and that is the habitat this species often prefers. Yellow (or Golden) Lupine is another famous annual lupine in California, and it lights up whole coastal hills as part of the big wildflower bloom with stunning spikes of butter yellow flowers. Sky Blue Lupine is another California annual, is a particularly bright blue species. Blue-Pod Lupine is one of the tallest and most beautiful western perennial species, common to our Pacific Northwest and British Columbia. This is the mostly blue species that is the dominant parent of the most famous lupines of them all. The "Russells" are the award-winning results from the labors of an obscure British horticulturist who worked with seeds of the wild American species for over two decades, finally displaying his spectacular results in 1937. The gardening world was stunned, and all kinds of acclaim and awards were showered on Mr. Russell. He had single-handedly perfected the usually-blue wildflower which often had gaps in the flower spikes to a multicolored group of magnificent, perfectly-complete blooms in solid colors plus endless color combinations and bi-colors. Ever since, the "Russell Hybrid" lupines have been the basic group from which all new hybrids are created. Today, many of the tall, (to 5 ft.) original "Russell Hybrids" in a rainbow of colors, have become "naturalized" in many areas of North America - and in many foreign places, famously in New Zealand. In North America, the biggest show of these "hybridized wildflowers" is along the coast of Maine and north into neighboring Canada, over 3000 miles from the species' ancestral home! Today, in Maine, thousands of postcards are sold of the rainbow of lupine bloom that grows wild right down to the beach's dunes each year in late spring, creating a spectacularly colorful show. 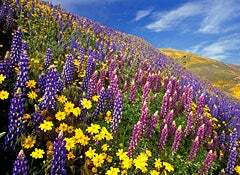 Wild Lupine is the blue perennial species native to the largest area of our continent. Growing naturally over almost the entire eastern half of the US (Maine to Florida, and west to the Rockies.) Wild Lupine is a popular wildflower wherever it blooms. Texas Bluebonnet is surely one of the most famous lupines in the world. Carpeting whole fields and roadsides in the Texas “Hill Country” every April, the Texas state flower is so spectacular, there are special tours, festivals and other big events every spring when it blooms. The story about how the bluebonnet was finally "identified" as the state flower in Texas is interesting. Among all the wildflowers Texas is famous for, there are several similar, beautiful lupine species, and until it was settled, various Texans insisted only certain ones were the "authentic" bluebonnets. Finally, it was all settled by the Texas Legislature when they voted to agree that "several species qualify as the official bluebonnet," and included them all. Still, probably because of its botanical name, the most popular is Lupinus texensis, a rather short species with a deep blue color and dramatic white markings. The beautiful photo above is by nature photographer, Don Paulson. 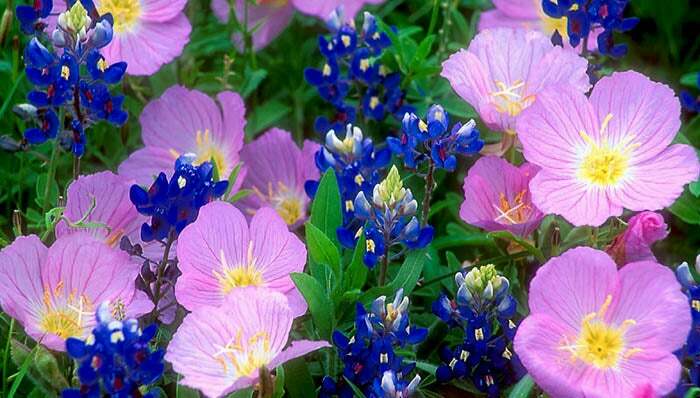 It shows Texas bluebonnets blooming in a meadow with Showy Evening Primrose, Oenothera speciosa, another famous Texas wildflower.